Let me briefly describe each of these ingredients and tell you how to obtain them. 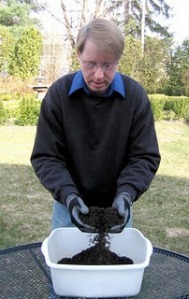 Well-worked garden soil – This can come from any garden bed that has been regularly amended with organic material. I usually select soil from my well-worked rose garden; it is the richest and loamiest earth on my property, filled with untold quantities of compost I work into it each year. 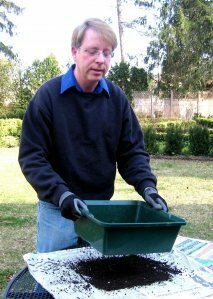 To prepare this soil for indoor use, I first sift it through a quarter-inch screen in order to filter out pebbles, twigs and worms (I refuse to harm a worm). You can make your own sifting-device by attaching a piece of quarter-inch hardware cloth to a wooden frame. Or, you can buy one already made, as I did, for about $20. Next, the sifted soil is poured into a roasting pan, sprinkled lightly with water, covered with a lid and baked for exactly one hour in a 180-degree oven. The goal is not to sterilize the soil, which would render it inert, but only to pastuerize it. Thus, nutrients are preserved, while weed seeds, insects and harmful pathogens are eliminated. 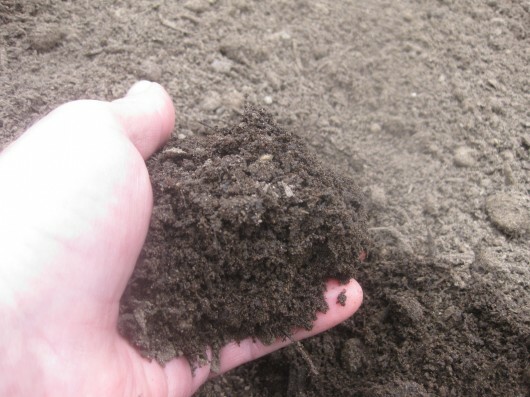 Contrary to what you may have heard, soil does not emit an unpleasant odor as it bakes. Leaf Mold – This is the soft, crumbly substance that results after autumn leaves are saved in a pile, moistened regularly, and allowed to decay for at least two years. The best leaf mold for houseplants is always found at the bottom of the pile. This, too, must be sifted and pasteurized in the same manner as for garden soil. I can’t imagine gardening without leaf mold. It is far superior to peat moss in terms of both nutritional value and moisture-retention. Compost – If you have a compost heap, you can use this rich, nutritious material for your houseplants. Gather some of the most decayed produce from your pile, then sift and bake it. Sand – This is the gritty matter that lightens and introduces pockets of air to the potting mix. I use coarse builder’s sand, not seashore or playbox sand. Builder’s sand is available at most hardware and building-supply outfits, but only in enormous quantities. If you don’t wish to have a heavy sack of sand in your house, you can always substitute perlite. Perlite is a volcanic mineral that forms porous white granules when exposed to high heat. You can buy it in small quantities at almost any garden center. I like to keep my soil components in separate, air-tight containers. Then, when soil is required, I can withdraw the approximate quantities I need and blend them by hand in a large bowl or dishpan. It is wise to vary the basic soil mixture for certain plants. African violets and ferns, for instance, prefer a light, woodsy formula. For them, I increase the amount of leaf mold and reduce the sand. Azaleas and citrus plants like an acidic soil, so I add to the basic mix either a handful of composted oak leaves, or humus gathered from beneath my arborvitae hedge. I give my geraniums and herbs soil, leaf mold and sand in equal parts. Learning to make potting soil is no different from learning to cook without a recipe. One has to experiment with the ingredients and adjust their proportions until the concoction seems “just right.” Remember that most plants aren’t overly fussy about soil. If your mixture holds moisture and drains well, you’ve essentially hit the jack-pot. Houseplants do not require a diet of expensive, peat moss-based potting formula anymore than a child requires a diet of cheez-whiz. When we make our own potting soil from sustainable substances, our planet, plants and purses all benefit. Won’t you give this soil-making venture a try? Can You Help the Honey Bees? Yes, a pleasant thing as can not be involved with the garden. Good work. Welcome to A Garden In The House, istanbuldaily! Hello again. This is a very interesting idea. I’ve always used peat because that was the way it was done. I’ll have to try this on some of my plants to see if there’s a difference. First of all, I love this blog! The photos are great and you write so well. I am not doing much gardening right now but might get inspired to do so based on what I have read here so far. Welcome, Jed! I hope you will stop by often! I recently became a Master Gardener and believed I was better than average in the garden knowledge department… U til I subscribed to your newsletter! You are fantastic!!! I have a west facing sidewalk with too far spaced apart boxwoods. It will take forever for them to grow tight enough for a hedge. Can you give me more detail on boxwood cuttings for a large area? Thank you! You are marvelous I’m so glad I found you!! a result of the fire communicated in the post I looked at. drop a comment 😉 I actually do have 2 questions for you if it’s okay. Is it simply me or do a few of these responses appear like coming from brain dead folks? 😛 And, if you are writing at other online social sites, I would like to follow you. Would you make a list the complete urls of all your shared pages like your twitter feed, Facebook page or linkedin profile? Thanks for a wonderful lesson in soil building. By any chance would you write about how to grow citrus? And is there any chance they can be grown from seed? Thanks for a great blog, on so many subjects.